As part of my effort to always keep improving and expanding my skill set, I read a lot of books on photography, business, and art and I just finished Michelle Turner's The Wedding Photography Field Guide. Simply put, this is an excellent reference for anyone involved in wedding photography. Michelle's work is beautiful and fun and the book is filled with great examples of it for inspiration. Every page has multiple images that illustrate the points she is making and just looking through the images is worth the low price. The guide starts with the very basics (camera and lens selection) and goes all the way to post-processing techniques and workflow. Seeing how other photographers look at elements of wedding photography is a great way to improve your own skills and Michelle's book has a lot of great tips learned from her successful career. Sections include: Gear, Preparation, The Wedding Day, and Post Production. Each section is broken down into specific chapters like Posing, Reception Details, Cake Cutting, etc. The book really covers almost everything involved in photographing a wedding. I also love that Michelle included 7 "Real Weddings" in which she talks about past clients and their wedding photography. 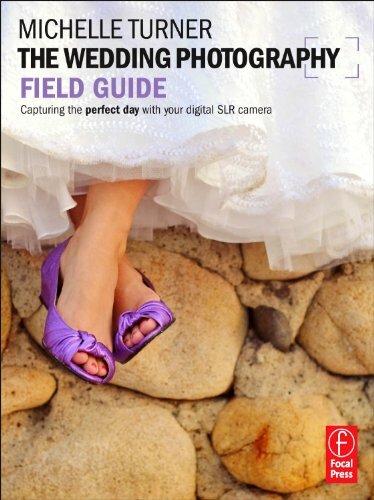 I would definitely recommend The Wedding Photography Field Guide to anyone interested in wedding photography, regardless of skill level. Find the book on Amazon. If you have any great book recommendations, let us know in the comments.